Asefi, Maziar, Mitton, Mandala, Currie, Shanelle. (1396). A New Foldable Kinetic Architectural System: Through an Evaluative Approach of Built Examples, Case Studies: Resonant Chamber, Cheiljedang Research Center, Madina Shadi Project. معماری و شهرسازی آرمان شهر, 10(18), 1-12. Maziar Asefi; Mandala Mitton; Shanelle Currie. "A New Foldable Kinetic Architectural System: Through an Evaluative Approach of Built Examples, Case Studies: Resonant Chamber, Cheiljedang Research Center, Madina Shadi Project". معماری و شهرسازی آرمان شهر, 10, 18, 1396, 1-12. Asefi, Maziar, Mitton, Mandala, Currie, Shanelle. (1396). 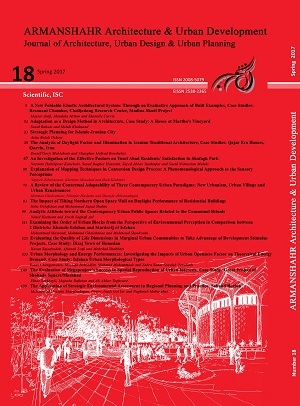 'A New Foldable Kinetic Architectural System: Through an Evaluative Approach of Built Examples, Case Studies: Resonant Chamber, Cheiljedang Research Center, Madina Shadi Project', معماری و شهرسازی آرمان شهر, 10(18), pp. 1-12. Asefi, Maziar, Mitton, Mandala, Currie, Shanelle. A New Foldable Kinetic Architectural System: Through an Evaluative Approach of Built Examples, Case Studies: Resonant Chamber, Cheiljedang Research Center, Madina Shadi Project. معماری و شهرسازی آرمان شهر, 1396; 10(18): 1-12. 1Associate Professor of Architecture, Department of Architecture and Urbanism, Tabriz Islamic Art University, Tabriz, Iran and Visiting Faculty, Department of Architectural Science, Ryerson University, Toronto, Canada. 2Graduate Student of Architecture, Department of Architectural Science, Ryerson University, Toronto, Canada.